Small and Medium Enterprises (SMEs) have an important role to help the regional economy. According to BCIG (2016), SMEs contributes 99.95% of the number of enterprises in Indonesia. This shows that the SMEs has considerable opportunities to help move the economy of the country with its production. But in reality, the productivity of SMEs is generally still low. Production control in terms of machinery, number of workers, work scheduling, etc., has not been done well. So that the productivity achieved is not optimal. Based on this problem, we work with one of the SMEs in Yogyakarta to analyze the existing problems in partner SMEs by modeling the problems that exist in the partner SMEs. The model then used to analyze and provide appropriate recommendations to be applied to partner SMIs in the hope that the recommendations we offer can be applied and can improve the productivity of partner SMIs. The SMEs analyzed is Bangkit Gallery. 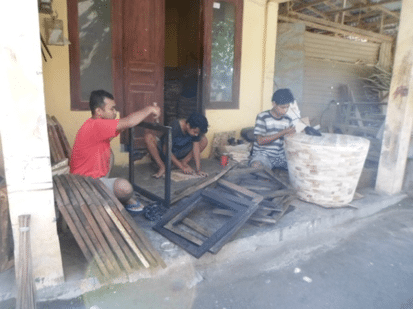 Bangkit Gallery was established in 1992 in the field of wood craft with superior products is craft that made from the roots of teak trees which have been broken down into designs. In addition, IKM also accepts orders for various forms of wood crafts from customers. 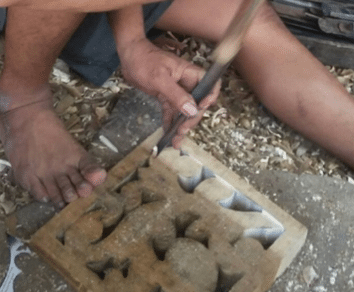 Mr Sulawi is looking for raw materials from the Gunung Kidul area. The production capacity for the simple craft model is around 500-700 units per month, while for the production of the complex craft model is able to make around 200-300 units per month. Mr. Sulawi markets locally and exports include America, Australia, Thailand and the Europe. The system is then analyzed to find out the process that has the longest time, and it is known from the simulation conducted at Flexsim if the process has a lot of bottlenecks. From the results of the analysis and simulation, it is found that the longest process is the process of cutting the pattern and process of carving. To fix the problems in the system, improvements are made to the system. Scenario 3 is adding 2 cutting machines, 1 sawing machine and 1 chisel machine. Of the three scenarios, it is found that the best simulation that can optimally increase IKM Bangkit Gallery production output is the third solution, where the amount of output is more than 2 times. Thus, a feasibility analysis is carried out on the solution, so that the solution offered is truly feasible and able to be applied to the IKM. It is found that the B / C ratio for the analysis is 1.4, which means that the solution is feasible to do. So solution for improving the productivity of IKM Bangkit Gallery is obtained by adding 2 cutting machines, 1 saw machine and 1 chisel machine, and 1 worker in each of the added processes.